A call to Ian Fenton at First Class Nautical brings news of a €250,000 price cut on the 26m motor yacht Eleonora, jointly listed with Martin Gwynn. Built by Moonen in 2005, as one of the yard’s Moonen 84 series, she had extra large fuel tanks installed from new, giving her an extended range. Featuring an innovative interior in warm woods and fabrics by Art-Line, Eleonora accommodates eight guests in a master suite, VIP stateroom and two twin cabins. 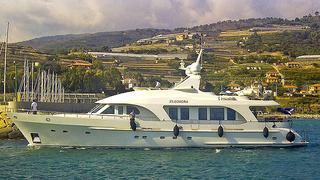 Eleonora is down from €3.5 million to €3.25 million.